“Today, we reflect on the strides we have taken toward overcoming HIV/AIDS, honor those who have made our progress possible, and keep in our thoughts all those who have known the devastating consequences of this illness. The road toward an AIDS-free generation is long — but as we mark this important observance, let us also remember that if we move forward every day with the same passion, persistence, and drive that has brought us this far, we can reach our goal. We can beat this disease. On World AIDS Day, in memory of those no longer with us and in solidarity with all who carry on the fight, let us pledge to make that vision a reality. 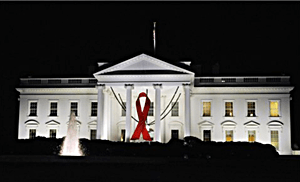 “NOW, THEREFORE, I, BARACK OBAMA, President of the United States of America, by virtue of the authority vested in me by the Constitution and the laws of the United States do hereby proclaim December 1, 2012, as World AIDS Day. I urge the Governors of the States and the Commonwealth of Puerto Rico, officials of the other territories subject to the jurisdiction of the United States, and the American people to join me in appropriate activities to remember those who have lost their lives to AIDS and to provide support and comfort to those living with this disease.” – President Obama. Why Puerto Rico… explanation please.